I’d been treated to a big lunch and knew I wouldn’t want a full dinner. But what to have? On the walk home from the station I got a craving for cheese scones. A hot scone or two with a little butter melting on them… yes! When I got in there was a little package of cheese waiting for me from Joseph Heler. It was “Red Leicester with Authentic Indian Chutney”, traditional English cheese flavoured with Geeta’s mango chutney. I hacked off a chunk immediately, and it’s perfectly pleasant but not bursting with Indian flavour. It’s the kind of thing that would be perfectly good as part of a wider cheeseboard, along with the Wensleydale with cranberries or stilton with apricots or Dairylea with ginger or whatever. 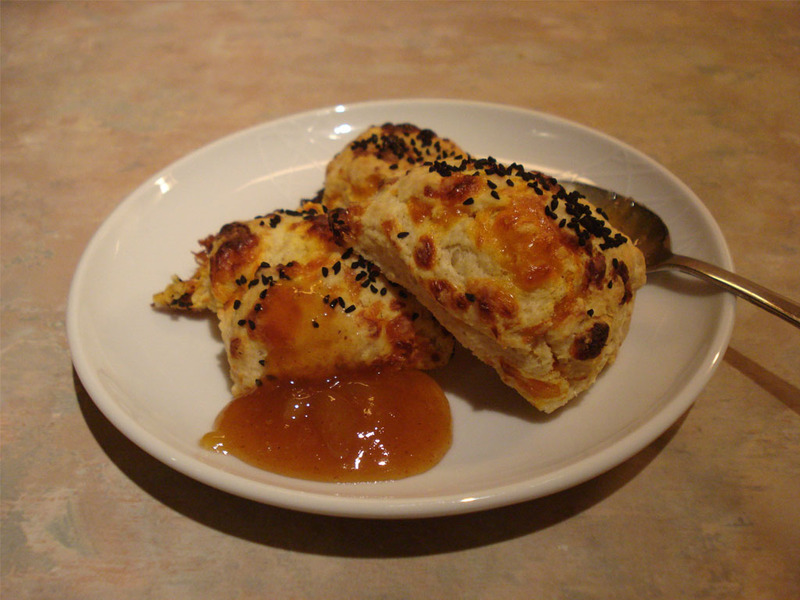 It was just in time for my cheese scones though, and with an extra kick of Indian spicing it made a great snack. And make sure you serve it not with strawberry jam, but more mango chutney. Preheat the oven to 220°C. Mix the flour, baking powder, garam masala and salt together, then rub in the butter. Mix in the cheese. In another bowl beat the egg and 2 tablespoons of the milk together, the incorporate into the mixing bowl. Blend gently – try not to over-mix – and pull together into a soft dough. It should leave the bowl clean. Pat gently into a chunky patty about 2cm thick, slice roughly and put on to a floured baking tray. Brush with the remaining milk, scatter over the nigella seeds and bake for 15 – 20 minutes until golden brown. Cool on a wire rack for about 10 seconds before scoffing the lot with mango chutney on the side.